Packing light, especially if you're planning to visit more than one city or taking the train, is an art. A light bag can make the difference between a pleasant or unpleasant experience. Use these tips and tricks to pack light. While all the major Paris train stations have left luggage facilities, many French train stations do not have lockers available, and a quick day trip to a passing village can be unbearable dragging heavy suitcases around town. Check out which stations have left luggage facilities in France. However, you don't want to get to France and realize you don't have your prescription medicine, extra contact lenses, essential clothes, underwear, etc. There is an art to packing light AND packing well at the same time. Use these tips and tricks to travel as lightly as possible, without missing important items from home. As soon as you know you're going to visit France, put a box or basket in a convenient place to drop necessities for the trip into. Also consult a packing checklist and keep it on top. You can keep adding items, checking them off. Buy a small collapsible bag to fold up and cram into your main bag. You can be certain you'll buy something in France, and this means you have one manageable bag without spending money over in France. Think long and hard about what you plan to buy there. 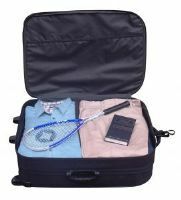 If there is something you're packing, but will probably buy while in France, leave it out buy it on your vacation. Get a rolling suitcase or backpack. Even a light backpack can get heavy after a while carrying it around. Don't think that the wheels will save you all the time, though. If a bag is too heavy to carry, you won't be able to get it up and down the train platforms (often stairs). There will be times when you have to carry that bag. Make that suitcase small enough to carry on the plane. That way you won't have to bother with the wait for luggage, or the potential for lost bags. Any necessary travel documents, such as a passport or visa. Also leave copies of these documents with a trusted friend or family member in case they get lost. A piece of paper listing phone numbers for all credit cards and listing stubs numbers from traveler's checks in case they get lost. Copies of all hotel confirmations. If you did not get a confirmation by e-mail or fax from a hotel, insist on it while you are still home. Detailed maps and directions from train station or airport to your hotel. Don't assume a cab driver will know. Euros! Never enter a country without at least a little local currency. Of course, don't go nuts and get hundreds of euros at your local bank, where the exchange rate is so-so. For more tips, consult Getting Cash In France - DOs & DON'Ts. Prescription drugs. Not only would it be hard to get a prescription filled while traveling, it might be impossible if the same drug is not available in France. Also don't forget backup contact lenses. Wallet, purse, and other items you would normally carry at all times. In the madness of last-minute packing, these essentials can get forgotten. Airline tickets and plane tickets or the information on your phone. Electrical currency converters and plug adapters (yes, these are two different things, and both are necessary). If you plan to bring a laptop, which I wouldn't recommend if you are packing light, you will also need a telephone adapter. Keep in mind, however, that most hotels have free Internet access and many cities have cyber-cafes in France. Search for thin, synthetic fabrics. They not only take up less space, but they dry quickly if you need to hand-wash them in a hotel room. There is no need to spend loads of cash on "travel" clothes. Look for polyester or rayon blends which are wrinkle-free. At home, pay attention to which clothes come out of the spin cycle nearly dry. Bring some travel-sized Woolite with you or, at a pinch, use the hotel's shampoo. Determine what you REALLY need to take. I would suggest setting aside all the clothes you think you need to pack. Then live just on those clothes for the number of days you will be in France. Do not do any laundry, but if you want to re-wear something enough; hand wash it. You will probably be surprised at how many items you never wore during that period. Axe those pieces off your list. I know this might sound appalling to some of you, but invest in one pair of shoes to wear and NO MORE. If you go to a comfort shoe store, you can probably find a pair that will be comfortable for loads of walking but look nice enough to wear for dressed-up dining. You will spend more, but it will be worth it. And you won't have bulky shoes to pack. Pack clothes all along a similar color scheme so you can mix and match. Why have three full shirt-skirt-jacket combos when you can have a couple of shirts, one skirt, one pair of pants and one cardigan, for instance. Eliminate nearly all bulky, heavy items. Don't pack more than one pair of jeans or heavy sweater. For one thing, you can probably re-wear some of the heavier items. For another, you will take up the space and weight of several lighter items. Find some old clothing or cheap underwear that you won't mind leaving behind as you wear it. That will clear some space as you go along. We all need some very basic toiletries when we travel. Who can live without a toothbrush or soap, after all? But there are some tricks to eliminating unecessary items or keeping them light and small. Many of the basic items, like shampoos, soap and conditioner, will probably be provided by your hotel. I always THINK I need to pack this stuff, and end up with a suitcase loaded with tiny hotel bottles. Even if you won't be staying somewhere with great toiletries, what could be more fun than having an excuse to buy French milled soap in Marseille for instance? Save yourself the over-charges of buying sample sizes. Get a few small bottles and fill them with your favorites and add a label. Or go around to freebies sites to find companies that give away samples. Some come in packets instead of small bottles, which pack even better. Get a small travel toiletries bag to keep this all organized. If you get a small one, it will also help you keep the toiletries under control. Don't pack a hair-dryer if you can avoid it. Almost every hotel in France has a hair-dryer.